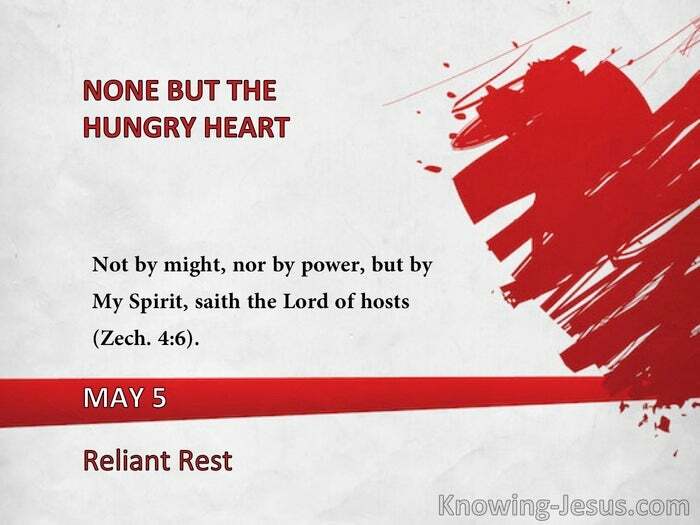 Not by might, nor by power, but by My Spirit, saith the Lord of hosts" (Zech. 4:6). Our Father allows us to be independent until by that means we come to know our own weakness and need. "Strength is always the effect of having to do with God in the spirit of dependence." "Some say, I want to feel that I am strong.' What we need is to feel that we are weak; this brings in Omnipotence. We shall have a life of feeling by-and-by in the glory; now we are called upon to lead a life of faith. What believer but knows from the experience of the deceitfulness of his own heart, that, had we power in ourselves instead of in Christ, we should be something. This is what God does not intend." "The very essence of the condition of a soul in a right state is conscious dependence. Now one may use the fact of completeness in Christ to make one independent. Two things are implied in dependence: first, the sense that we cannot do without God in a single instance; and, secondly, that He is for us.' In other words, there is confidence in His love and power on our behalf, as well as the consciousness that without Him we can do nothing." -J.N.D. "We are to walk humbly and lean ever and only on the mighty arm of the living God. Thus the soul is kept in a well-balanced condition, free from self-confidence and fleshly excitement, on the one hand; and free from gloom and depression, on the other. If we can do nothing, self-confidence is the height of presumption. If God can do everything, despondency is the height of folly." "But my God shall supply all your need according; to His riches in glory by Christ Jesus" (Phil. 4:19).